John Moses Browning developed the M1911 handgun which was adopted by the military in 1911. Per military specifications he included a lanyard ring on both the pistol and magazines to prevent cavalry soldiers from losing them while mounted on horse-back. 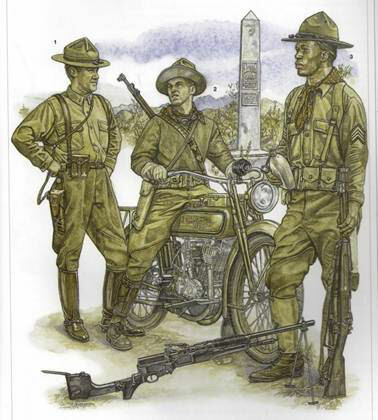 The officer on the far left in the above drawing has a lanyard looped over his left shoulder and connected to the loop on his M1911. 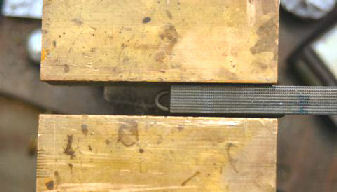 The original model of 1911 had a smooth, flat mainspring housing. When the gun was modified into the M1911A1 the mainspring housing was arched with grooves. The arched mainspring housing causes the gun to be tipped up in the hand. In this article I’m going to discuss two methods of adding a lanyard ring to a 1911; purchasing a new mainspring housing with the lanyard ring already installed, and installing a lanyard ring in an existing mainspring housing. This method is the easiest because it is strictly replacing a part. Personally I prefer a flat mainspring housing and all of my 1911s have one. My Rock Island Armory M1911A1 came with a grooved, flat mainspring housing, but I wanted the lanyard ring for authenticity. I purchased a smooth, flat mainspring housing off of ebay which fit my RIA M1911A1 perfectly. In case you’re wondering, I slam a magazine home with the heel of my hand; the lanyard ring never touches my hand. I prefer a grooved mainspring housing so I got out my 20 lines per inch checkering file I purchased from Brownells # 080-310-401 to add vertical grooves. I put the mainspring housing in my vise and used the bronze vise jaws as a guide. Notice in the above photo how the mainspring housing is deep in the jaws. I grooved the center of the mainspring housing keeping the edge of the file against the vise jaw, and filed until the file wouldn’t cut metal anymore. I cleaned up the grooves with a triangular needle file. I moved the mainspring housing up so the surface was exposed. I rotated my checkering file so I could add grooves to the edges. 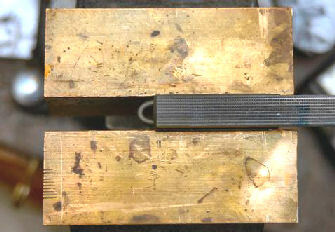 The checkering file in the above photo is actually tipped down. Although the mainspring housing is flat from top to bottom, it is curved from side to side. I again cleaned up the grooves with a triangular needle file. 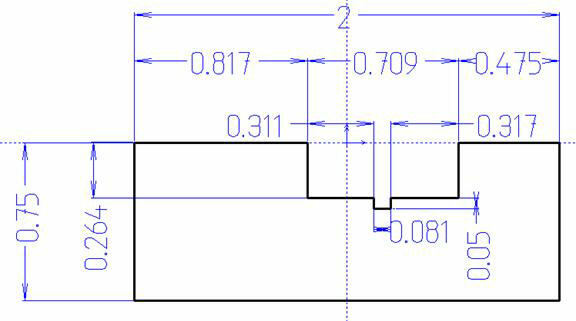 If I had wanted to checker the mainspring housing, I would have used the 20 LPI checkering file and filed at right angles to the vertical grooves making nice, square points. After the grooves were cut to my satisfaction I bead blasted it to remove the old finish, then Parkerized it to match the rest of the gun. The result looks original. 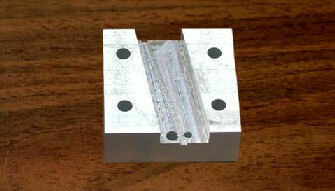 This method is by far the most difficult because it requires precise machining. However, rather than replacing a custom or special mainspring housing, this method allows me to keep it, especially if it is custom and matches the gun. Besides, I got to do some real gunsmithing! 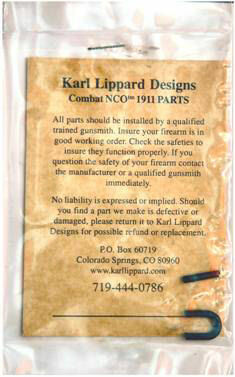 Karl Lippard Designs sells the lanyard ring and retaining roll pin on ebay. He also provides a copy of the M1911A1 mainspring housing mechanical drawing. Unfortunately, it is a copy of a copy of a copy, etc. so it is somewhat difficult to read. Fortunately Rio Benson of Benson Consulting, LLP created a full set of M1911A1 drawings which you can download here. Page 30 has the exact same drawing, but much clearer. I will not include the drawing in this article because you can download it yourself. I wanted to be able to mill/drill the holes accurately and be repeatable so I designed a jig using CorelDraw v12 and BobCAD-CAM v20. I used the dimensions from the M1911A1 mainspring housing drawing to design the jig. The drawings below show the specifications for the jig. 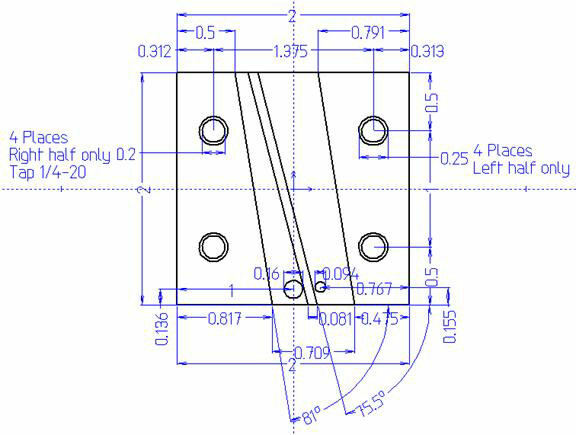 I never took mechanical drawing in school so I probably haven’t followed established guidelines, but all the numbers are there. I have trouble visualizing a three-dimensional part from a set of drawings so I developed a 3D rendering to show what the final jig half would look like. 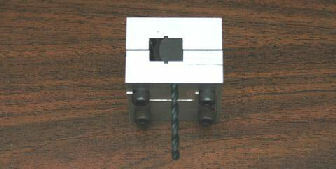 The right half has four holes 0.200” in diameter which are tapped for 1/4-20 screws. The left half is a mirror image of the right half, and has four holes 0.250” in diameter for 1/4-20 screws. These screws hold the two halves together to hold the mainspring housing in place for milling and drilling. 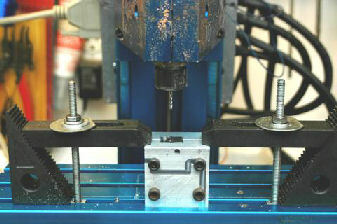 The jig is designed so the base of the mainspring housing is parallel to the milling table. This is because the holes for the lanyard loop need to be perpendicular to the base. 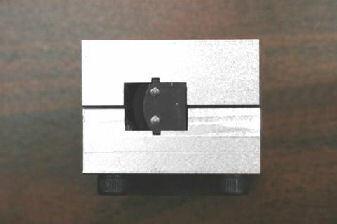 The cutout is wide enough to accept both flat and arched mainspring housings. I had some 3/4” aluminum stock so I milled two 2” x 2” blocks. In each block I milled the design you see in the above drawings. The width of a mainspring housing is 0.538-inches so I milled each block 0.264-inches deep; a little less than half. This is so when I install the mainspring housing in the jig and install the four hex-head screws, the mainspring housing won’t move. I also milled the holes for the two retaining pins so the mainspring housing would be aligned properly. As you can see from the above photo the jig holds both a flat, or arched mainspring housing. I purchased a 5/32” drill bit to act as an alignment pin when setting the mainspring housing in the jig. This fits through the retaining pin hole in the mainspring housing. I also purchased a 3/32” drill bit to drill the hole for the lanyard ring retaining pin. I took the original Rock Island Armory flat mainspring housing that came with my gun and mounted it in the jig. I used the 5/32” drill bit to align the mainspring housing with in the jig. I tightened the screws so there was an equal gap on both sides of the housing. This ensured the jig was square with the mainspring housing. I mounted the jig onto my CNC milling machine table so that it was square. I installed a 3/32 square end milling bit and positioned it 0.358” from the front edge and centered on the base of the mainspring housing. I milled two holes 0.1065” in diameter, 0.325” apart and 0.270” deep. I installed the lanyard ring in the holes, then used my bench top mill/drill to drill the 3/32” retaining pin hole using the jig as a guide. Drilling the hole also drills a notch in each leg of the lanyard ring which keeps the ring in place when the pin is installed. I installed the provided 3/32” roll pin in the retaining pin hole I just drilled. It is much easier to replace a part than to modify an existing part, but now that I have a jig I can add a lanyard ring to any existing mainspring housing. For the same price as one pre-formed lanyard ring I purchased a one-pound coil of 37 gauge (0.106) steel music wire from MSC Industrial Supply Co. part number 31980964. This gave me about 34-feet of wire which would make hundreds of lanyard rings. I purchased steel so it would take bluing or Parkerizing to match the original finish on the mainspring housing. They also sell this wire in stainless steel part number 31981194. 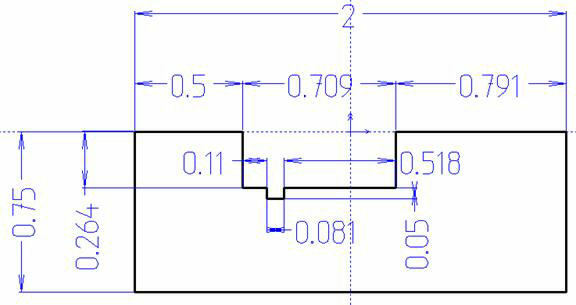 The above figure shows the dimensions of the lanyard ring. The distance between the two legs is 0.219” so I used a 7/32” drill bit to form the loop. I cut about 2 1/2“ of wire and held it in the flame of propane torch until the middle became bright red. I then forged the loop around a 7/32” drill bit to form the loop. Because the wire was so thin it cooled fairly quickly so I had to reheat it 3 or 4 times to get the shape I wanted. I cut the ends off using my Dremel tool with a cutoff wheel. I polished the loop with 400-grit wet/dry sand paper to remove any carbon and blemishes from the metal. I had a blued, checkered, arched mainspring housing in my parts bin so using my jig I installed my homemade lanyard ring onto that mainspring housing. I cold-blued the ring to match the housing. I fixed the loop in place with a 3/32” roll pin I took from my black roll pin set I purchased from Brownells #080-518-000. By removing the roll pin I can also remove the lanyard ring and return the mainspring housing to its original form. The only reason I installed the ring in this arched mainspring housing was to see if I could make the loop myself, and to test my jig and process a second time. Everything worked as designed and I now have a couple of spare mainspring housings with a lanyard ring.